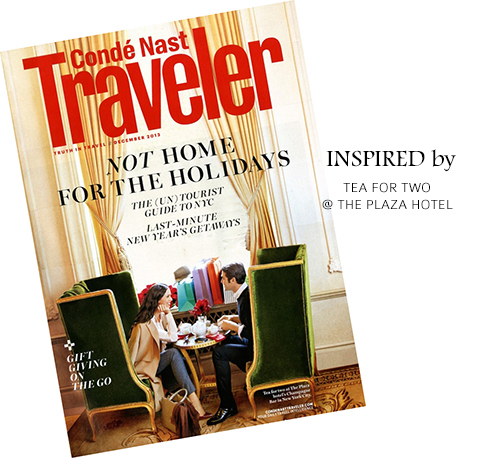 When I first saw the cover of Conde Nast Traveler back in December 2013, I was inspired. Very inspired. Immediately, I wanted a ‘Tea for Two’ corner somewhere in my house. I was obsessively attracted to the French feel of the space. Did a little homework and found out that The Champagne Bar’s (@ Plaza Hotel NYC) interior was inspired by Louis XV style of French decor. Naturally, I was addicted. After all, I’m living in the home of my dreams and its architectural style is from the French Second Empire era. 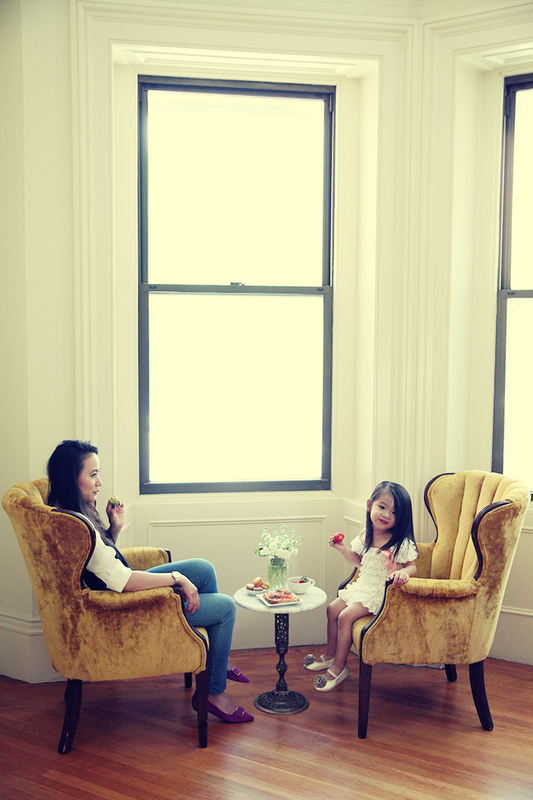 As the tea-sipping season is fast approaching, it was imperative that my dream sitting area comes to life. I can already imagine it. The perfect Autumn day- I am snuggled in a cozy fuzzy robe, reading a novel, sipping on chai lattes, in my perfect little “Tea for Two” corner. Thanks to Mr. Perfect, this imagined corner has become a reality. The hubs found a pair of antique barrel chairs on craigslist for just $100 total. 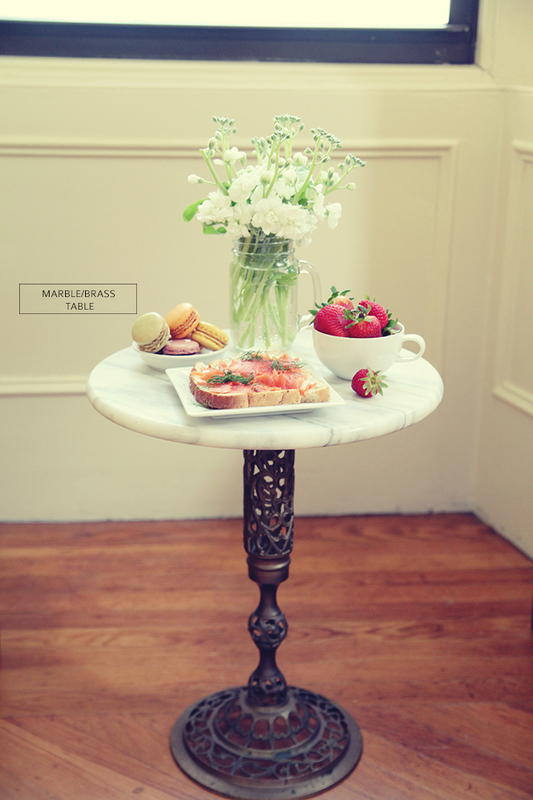 Then we went to an antique market, where we picked up a marble/brass table for basically next to nothing at $20! There are definitely times when the stars and moon align oh so perfectly. We set up this sitting space in our bedroom and although it’s bare bones right now (missing a rug + curtains), I can see it as being one of my favorite spots in the house. Like her momma, Zoey is already obsessed. 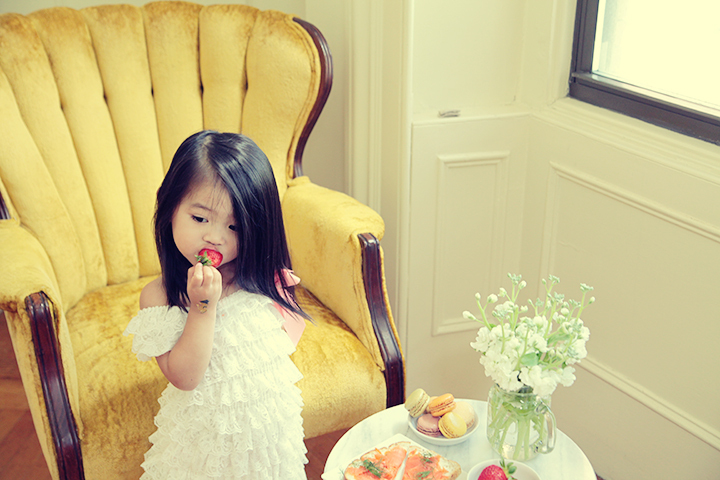 We’ve already had a few tea parties with her play tea set. And as promised, mommy set up a utensils-free brunch for Ms. Zoey. I’m glad that mommy and me share the same interests! It has been a year since we’ve moved into our home. The renovations are in full swing and we are slowly but surely decorating space by space, room by room. It’s a slow process but we are making sure that each room fits our personal taste. No interior designers here, just me and Mr. Perfect doing what we love and saving A LOT along the way. I hope you’ll continue to follow me through this home reno journey and grab some ideas along the way. Btw, have you noticed the new LZM site? Oh my goodness I absolutely love the French decor- and your husband’s knack at finding affordable furniture! 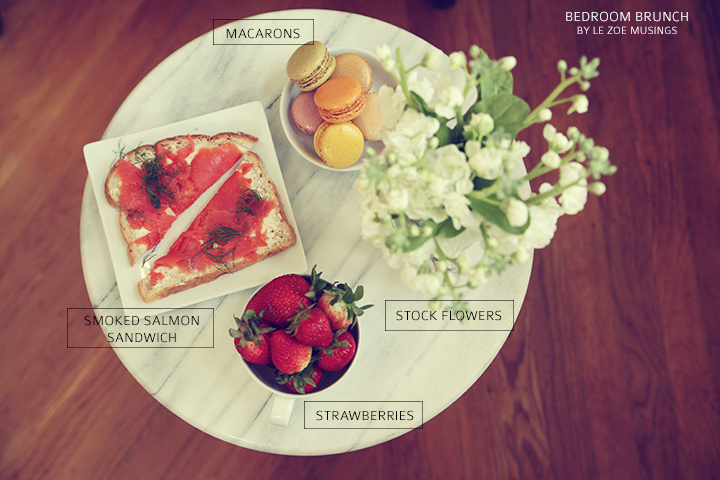 Firstly, I wanna say, loving your new layout and blog style~ It’s beautiful! As beautiful as your pictures. And then, I wanna say, Zoey is indeed your daughter~ brought up by you, I would be surprised if she didn’t like tea sessions. I think you taught her to love it, which is excellent. I love your new sitting space and the marble brass table is absolutely uniquely chic! I love this idea. Excellent post. Your daughter is so adorable.